Big Berkey water filter is our most popular system. And our top selling product is now on sale! 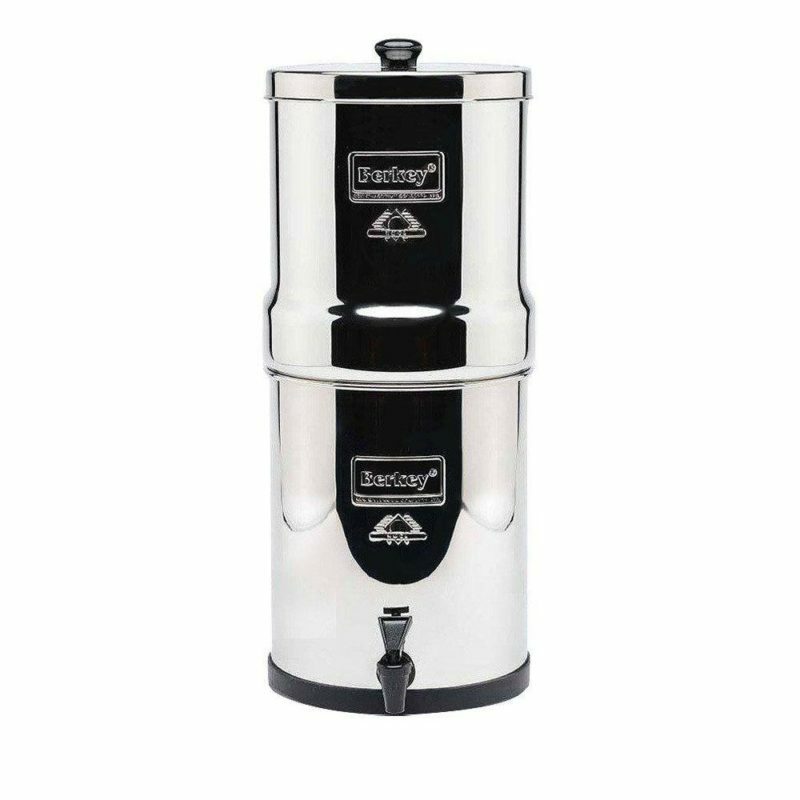 Big Berkey Water Filter is perfect for everyday home kitchen use as well as for outdoor activities. 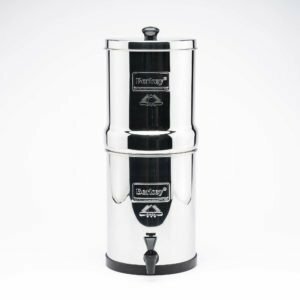 The Big Berkey system removes pathogenic bacteria, cysts, and parasites entirely and extracts harmful chemicals such as herbicides, pesticides, VOCs, organic solvents, radon 222 and trihalomethanes. It also reduces nitrates, nitrites and unhealthy minerals such as lead and mercury. This system is so powerful it can remove food coloring from water without removing the beneficial minerals your body needs. Constructed of highly polished 304 stainless steel, the system comes complete with four purification elements and utilizes the latest technological advances. We know that tap water has already been treated to make them safe to consume, however, that water still has to go a long way from the water treatment plant to your home. This water still has to go through miles and miles of pipes, and it could encounter a lot of things on its way, so how sure are we that it is really safe to consume? The thing is, the water that we drink should not only be labeled safe, but healthy. So how can you turn tap water into something healthy? 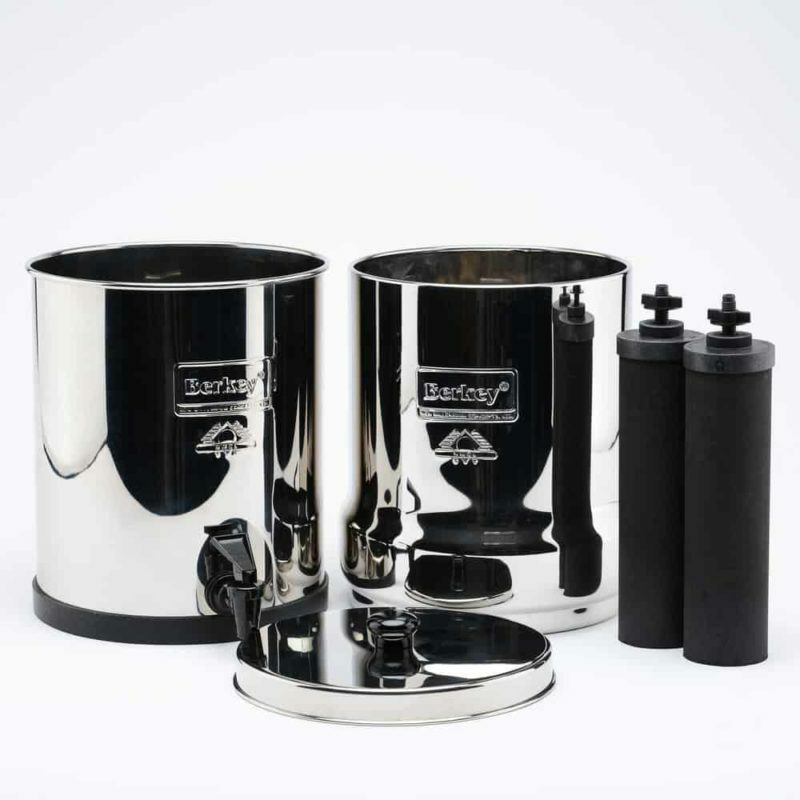 The answer: a home water filtration system and one of the most trusted water filters is the Berkey Water Filters. 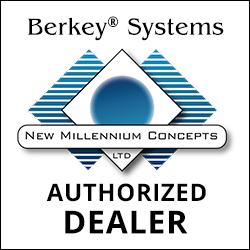 The Berkey understands that choosing the right water filter for your home can really be a hard task, so we offer you products that are everything you are looking for. 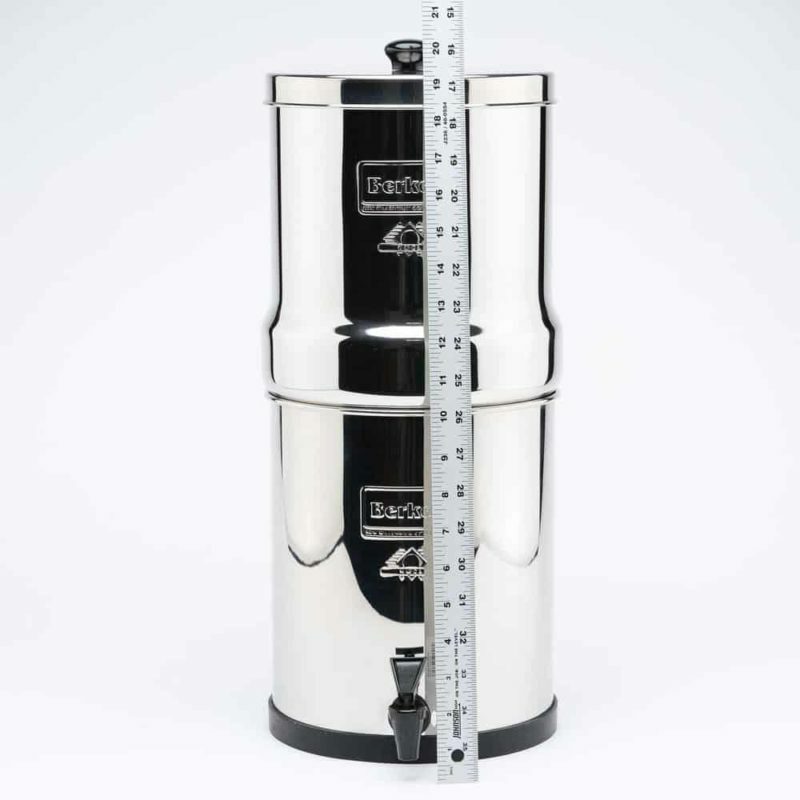 Filters of Berkey systems are made in the USA, and since we already have an established reputation in the industry and the results of their filtration tests are outstanding, we hold a gold standard when it comes to gravity filtration system. 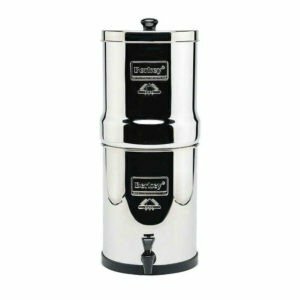 If you want a Berkey water filter that could serve your family of 4 or 5, then the Big Berkey Water filter is the one you should go for. 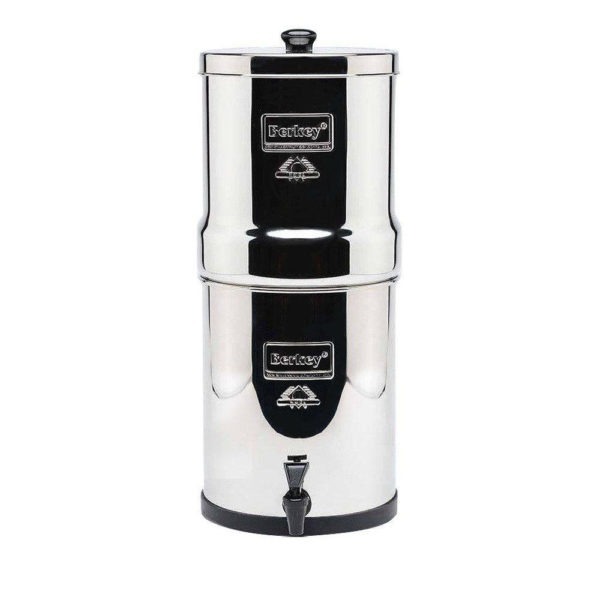 Big Berkey is a versatile water filtration system, and it is ideal for home use of a small or a medium-sized family, but you can also bring it on your travels or other outdoor activities like camping. 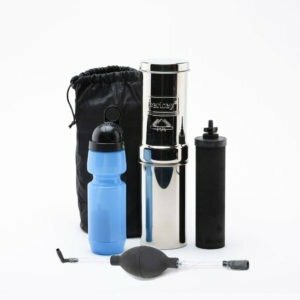 It is a powerful system that can purify both treated water and raw, untreated water from sources like stagnant ponds, streams, and remote lakes, and it does not require electricity that’s why it is perfect for everyday use. 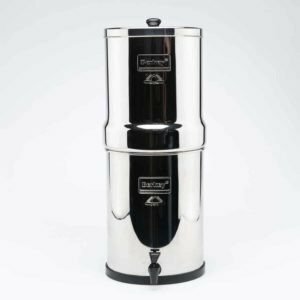 The Big Berkey filtration system is very powerful that it is classified as a purifier, it can remove cysts, pathogenic bacteria and other dangerous chemicals like pesticides, herbicides, organic solvents, VOCs, trihalomethane or THM and radon 22.2. The Big Berkey has been constructed with the used of 304 stainless steel that has been highly polished, the system of this water filter is equipped with two purification elements, and it also makes use of the latest advances in the filtration system technologies. This is a home system that would serve your family that is why it has a storage capacity of 2.25 gallons or 8.5 liters. 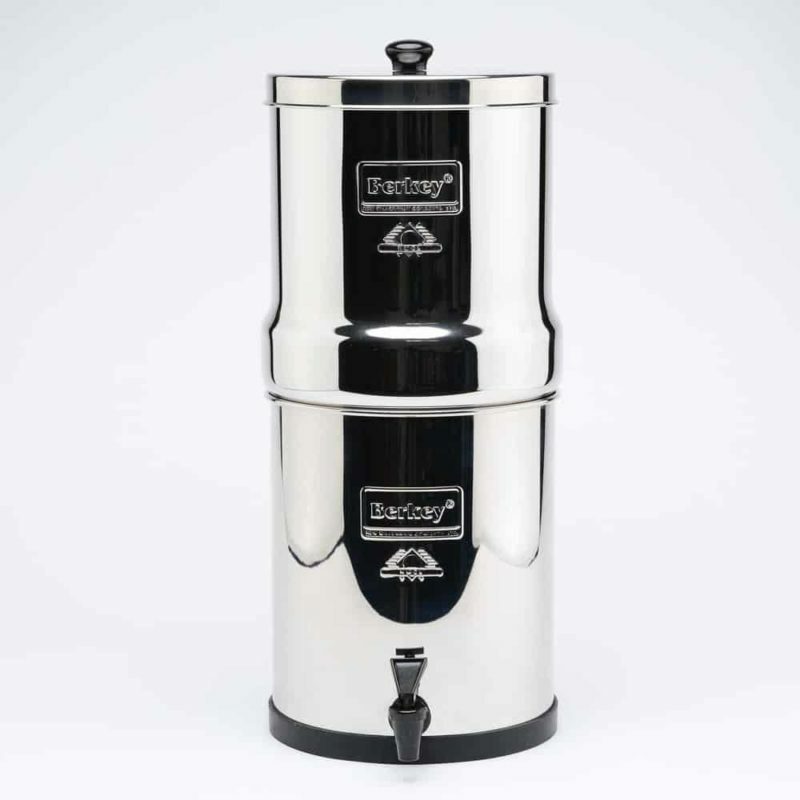 The Big Berkey has been configured with the use of two purification elements from the Black Berkey, and it has the capacity to purify up to 3 and a half gallons or 13.3 liters per hour. Its system can also be expanded into four purification elements making it capable of purifying 7 gallons or 26.5 liters of water per hour. Easy to fill too much and make a mess. Received a berkey sport bottle with purchase which does not look like the one in the photo and it leaks. Came with chipped drink spout but leaking occurs at the lid twist seal. Not the best it mine anyways. Great for what we need, but the maintenance to keep it CLEAN, “hydrated” (i.e. consider the filter elements when traveling away from home), and leak-free (i.e. occasionally at the spigot connection) is a headache. love it, actually easy to set up if you go on YouTube and follow the video I was hesitating about being able to put it together but I followed the YouTube video and had no trouble. I am a physician and have trained extensively in detoxification and environmental medicine. 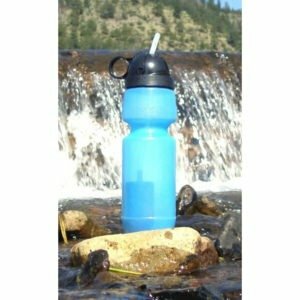 This is the water filter I recommend for my patients, and if you want clean water, this is one of the best options for you out there. The instructions included with the unit are absolutely terrible, so go to Big Berkey’s website and watch their videos. The tip of one of the black filters where the wing nut goes, broke clear off. Had to watch serval videos to obtain information on correct assembly. It took a while to set up, disappointed that I have to take it apart to return it. I hope the next one I order isn’t as fragile. I’m honestly wondering if I should order a new one. Although I was excited to try the Berkey Walter Filter, this product arrived with dings in it. Also, some of the black particles from the filter was loose inside the canister. I thought that I was purchasing a brand new Berkey, but evidently, this one is not. I’m returning it, and ordering directly from Berkey. A It's 20 inches tall. Q After first prime, water in upper tank still half full after filtering overnight. What's wrong? Q Does this model hold a total of 4 black filters and 4 fluoride filters? A it comes with two but it can be four because there are two holes for it. There still is a taste problem with the water. I'm not sure what it is but it is disheartening because I am avoiding using it. Q does it uses aluminum it to remove fluoride.? A The fluoride filters use "aluminum oxide" which is not the same as pure aluminum. It is not harmful to your health. Q will it filter pool water? A I believe so. Friends had a flood in their basement. Just to check out the Berkey they ran some of that dirty water through the filters and it was drinkable! Q The filtered water turns white if i let it sit in a glass cup for a while . Why? I did prime it and the water going in is clear. A The filtered water turns white if i let it sit in a glass cup for a while . Why? I did prime it and the water going in is clear. Q What does ppm count mean that alot of people are talking about? Q Can I use this in Mexico? Q Does it make sea water drinkable? Q how many gallons do the filters pass before replacement ? 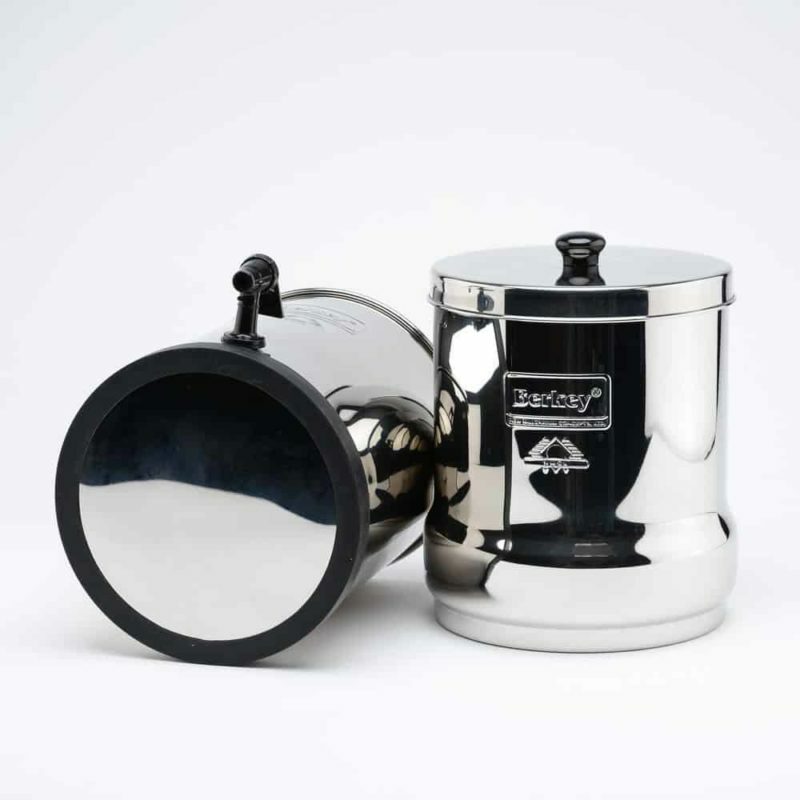 A Up to 6000 for the 2 Black Berkey Elements & up to 1000 for the 2 PF2 Filters. A Mine doesn't. I live in the Pacific Northwest and we had a terribly hot summer last year and ran air conditioning in the house, keeping the indoor temp around 80. Q How do you know how full it is? Do you have to take off the top part to see? A Absolutely no. You should use the system as it is designed to be used. Having to refill also opens the system to aeration. If you travel with it, just carry the 3 , 5 gallon with you or buy it as you need. Q Does this remove glyphosate? A Does this remove glyphosate? Q I have a shallow well. Will this work with it and will the filters need to be replaced often. 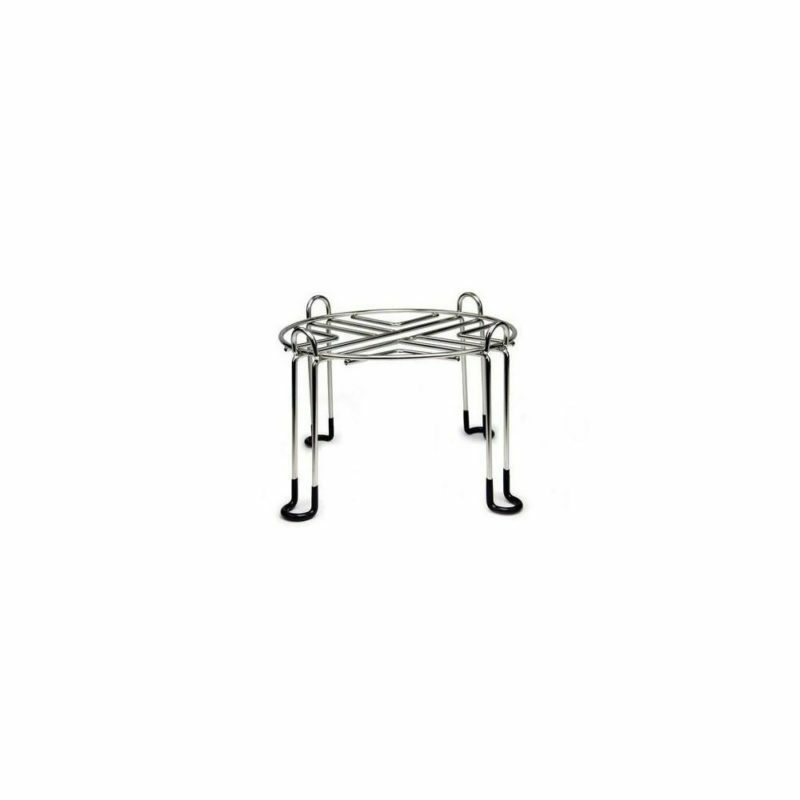 Is this my best option for having a shallow well? A It depends on what is in the water. You might have to clean the filters. I have a Big Berkey and my house has water softener system, I have had no problems. One daughter has a Big Berkey and is on city water directly. We set hers up in March and had to clean the filters in October. Another daughter has a Big Berkey and her water source is a well. She has had no problems with her system. We all enjoy the clean tasting water we get from the Berkey, I think it is worth it. Q How long does it take to filter the water with 2 black and fluoride filters? How about 4 filters? A The two black filters with the fluoride attachments take about 2 hrs. With the extra filters time is cut in half. Q How often do you have to clean the actual inside of the tank? Is this a difficult process? A Since I am a single guy I clean it every two months. Yes it is easy to clean. Takes me all but 10 minutes. Q I live in Portland OR, one of the few cities without fluoride added to the water. is there any other compelling reason to buy the fluoride filters? Q what warranty does the Berkey have? A 6 months...according to their website. A Actually, that is a good question but I do not think it takes salt out of the water. However, it does take a number of other substances out of the water that are harmful. On my filter there is a slight taste issue from the fluoride filter but for the most part it is ok if you can get used to the taste. You will have to ask the company about the salt in ocean water. Q What is known for the total amount of water this filter system can handle? Depends on how dirty I expect but any general estimates? 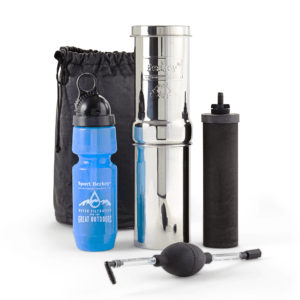 A You can purify creek water with a Berkey system. Q how long the filters last & how much each filter cost? A About 5 years: 2 of the filters last 6000 gallons, if you fill this up once per day (some days will be twice, others will 0, like when on vacation). At 2.25gallons a fill up thats 2,666 days or 7 years. I'd figure about 6 for a family of 2, 3 for a family of 4-5. Q Does it remove chlorine? A Yes, removes chlorine with just the normal black filters! 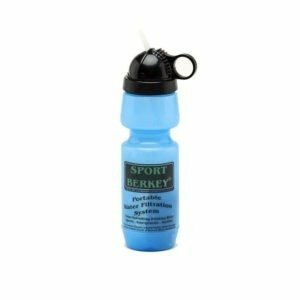 use it all the time to filter my city tap water to make the perfect "berkey" water! The other two supplemental filters are for fluorine and arsenic. Q so does Berkey make an undersink or do you have to fill all the systems? A You will need to fill all the systems from the top. Q Can this unit be used to filter river water in the event of a diasaster? A From the extensive research I've done, including testimonial videos I've watched, you should remove larger sediments before putting the water in the top part to prevent clogging. Other than that you should be fine. Just make sure you read the specs of your filter. I got separate extra filters. Q Can you tell me where these filters are manufactured? Q Do the filtering elements need to be replaced and if so, how often? A I heard they last years. Someone said that you can put red food color in the water and if it runs clean your filters are good. If not they need replaced. Q Does it remove heavy metals also ? Q I see that people are having problems with the fluoride filters is this a problem i should be worried about or should i get them? A The fluoride filters are an important component of the Berkey system if your water supply is municipal/treated. By following installation instructions carefully, and with proper flushing/priming of the filters, issues are usually avoided. If, by chance, the filter has some sort of defect, it's replaceable under the manufacturer's warranty (6 months for the fluoride filters). Q The bottom chamber has rust around the INSIDE edge. All the water tastes of it! Anyone else had this problem? It is brand new! A Yes. Initially, I thought it was just discoloration, and I did notice that sometimes the water would taste funny every now and then, almost metallic. Upon inspection today, I found out that the discoloration was a rust spot that penetrated from the interior wall to the exterior wall of the bottom chamber. Really disappointed about the quality control of this product, and wondering if the rust was contaminating our drinking water. Q This REMOVES fluoride effectively? A The fluoride add ons remove 68% or so on the first pass. If you run it through multiple times it removes 99.9%. Very difficult to get rid of the crap they add to our water. Supposedly for our health. Q Does the fluoride filter remove 100% of the fluoride in water ? How much does it remove? A NO. How much it removes depends mostly on the pH level of your water source. If it is municipal tap water, the pH is usually higher than 7 (neutral) and the higher the pH, the less fluoride is removed. My city tap water is above 9 (alkaline) so the amount of fluoride removed is probably less than 50% which is negligible and doesn't justify the cost, the reduced water flow rate and the health risks of inhaling alumina dust during filter priming (lung irritation and inflammation) and ingesting the alumina dust (stomach discomfort) after drinking the filtered water. Be aware the fluoride filters contaminate the air with alumina dust during priming and if you care about your lung health you should avoid priming them indoors and use a proper respirator. If you don't mind slowing down the filtration process, risking lung irritation from priming and risking constant mild stomach discomfort from drinking alumina contaminated water you may want to try out these filters if you know your water pH is at or below 7. If your pH is 5.5 (acidic) then the filters may filter up to 95%. Hope that helps. Q Would this make Flint, Michigan water safe to drink? Q just received berkey and the first batch of filtered water is cloudy. is this normal? A It's perfectly normal. Rinse the filters a few times by holding it against the faucet and letting water flow through for a minute or two. It's best to clean these filters once in a while by running water on them and scrubbing them off with a Scotch Brite pad. Also, store your water in glass containers, not plastic. I buy Pellegrino bottles by the case at Costco and those work well.